Since 1912, Mrs. Grass(r) soup has been a welcomed guest at your family's table. 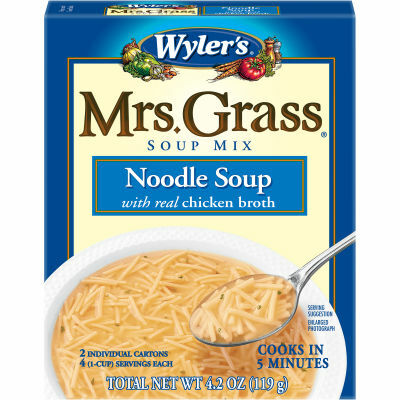 Today, you can trust that Mrs. Grass(r) soup will continue to provide wholesome recipes for your family to enjoy. Mrs. Grass(r) Noodle Soup is made with real egg noodles and real chicken broth so every spoonful has that hearty flavor you love. Mrs. Grass(r) soup(em)cooking up delicious recipes for over 100 years. Serving size 1/4 of each carton (15g), 1 Cup (245g) Prepared).